De594. 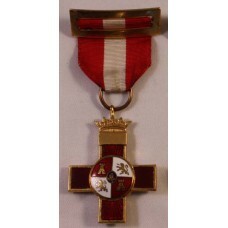 Badge Luftwaffe-Radio Operator, Air Gunner (ROAG) in Case of Issue. 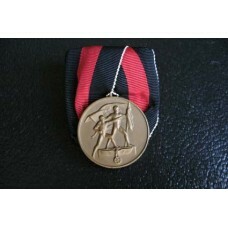 Made in Nickel-Silver (Bu..
De1236.SA Sport Badge First model in Bronce. 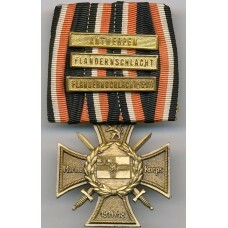 Marked with " Eigentum d. Chefs d. Ausbildungswezens - ..
De25a.Imperial Single Mounted Medal "Marinekorps Flandern" with Three Bars "Antwerpen-Flandernschlac..
De759.Luftwaffe Clasp in Gold (Zinc) with Pendant for Bomber. Maker marked with "BSW".Wartime or Pos..
De630.Flak Badge in silvered Zinc, maker marked with "A" for Assmann. Marked on the reverse and on t..
De41.Cased ROAG Badge with Lightning in NIckel-Silver.J1 Badge marked with "C.E.Juncker-Berlin SW". 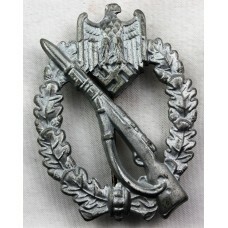 ..
De595.Cased ROAG Badge with Lightning in Zinc, maker "C.E.Juncker-Berlin SW68". Case is a little bit..